will enjoy our newly remodeled clubhouse, game room and playground. All that and a convenient location close to shops, restaurants, and local events. Campsites are offered May 1 – September 30 for a nightly rate of $45 or a seasonal rate of $2,100 – $3,000. All campers have access to new, private individual bathrooms and laundry facilities. Make sure to check out our brand new campsites! 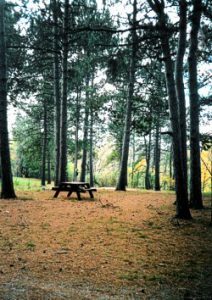 Each campsite is beautifully wooded with full hookups including cable tv (for seasonal rentals only) and internet. Book your RV site online today!